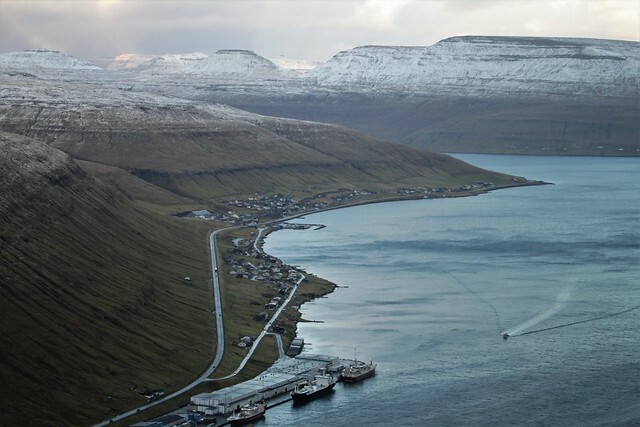 The boat from Iceland to the Faroe Islands takes about 20 hours. I was starting to get cabin fever by the time the islands first appeared in the distance so rushed out on deck to face the Atlantic wind with my camera. 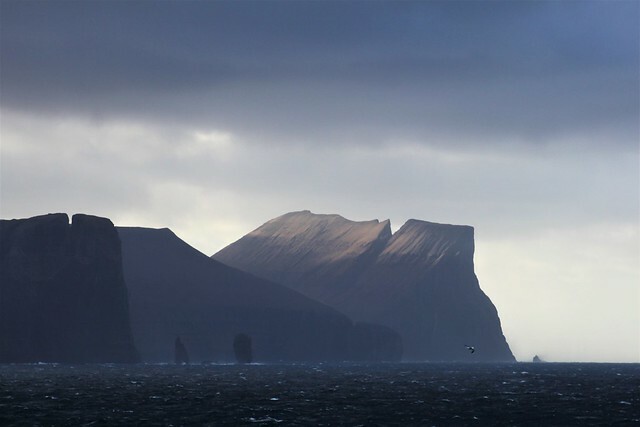 Sailing into the Faroes was an extraordinary way to reach the country. Probably one of the finest spectacles of my entire trip. 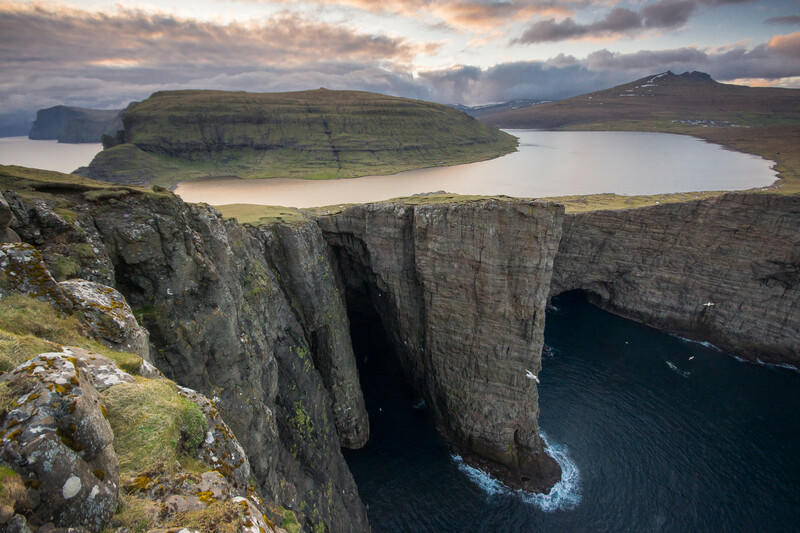 The islands just poke up out of ocean often in the form of sheer cliffs. The clouds hang low over them and they look quite menacing. 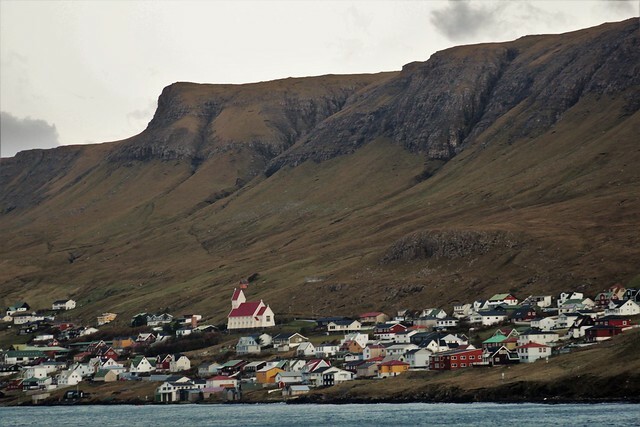 As you sail closer you can spot tiny villages tucked in between the mountains and waterfalls tumbling into the sea. You could be forgiven for knowing nothing about this little nation. 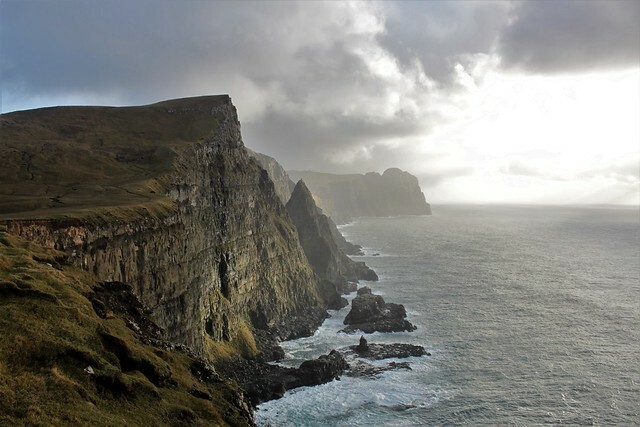 It is almost exactly halfway between Iceland and Scotland and home to about 50,000 people. 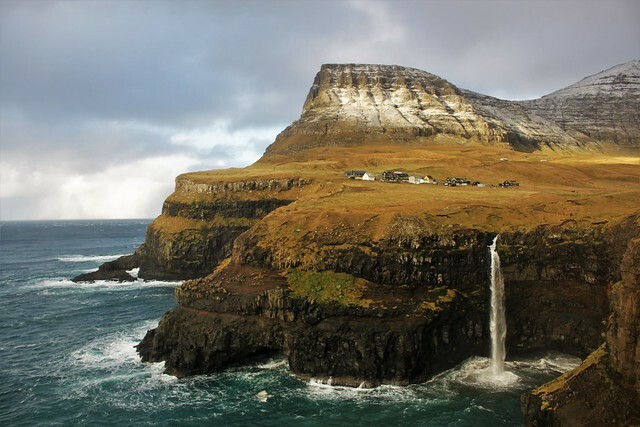 The Faroe Islands is an autonomous country within the Kingdom of Denmark but the Faroese have their own language and culture. 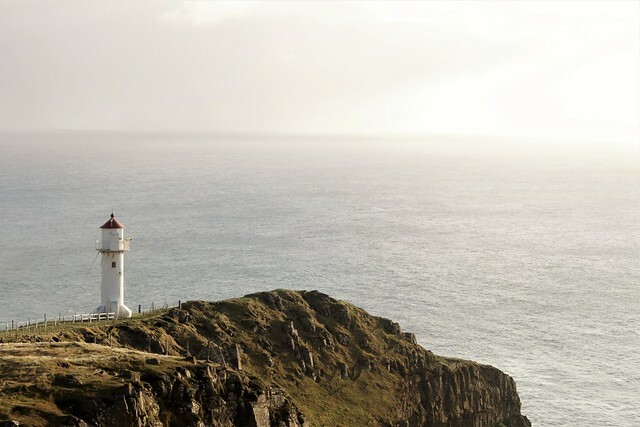 If you have been reading this blog from the very start – you deserve a prize if you have – you may recall that I am part-Faroese. My grandmother is from this country and when I was in Denmark (a month into this trip in February 2015) she took me to ‘The Faroese House’ in Copehagen to eat sheep head – a national favourite. Click on the hyperlink in the previous sentence to see a picture of it. The first barrel of my surname is her Faroese family name Kambskarð. My Danish grandad met her on the Faroes and they moved to Denmark where my mother was born and raised. My Danish mum met my English dad and they moved to London. There’s a quick family history of that side of the family for you! 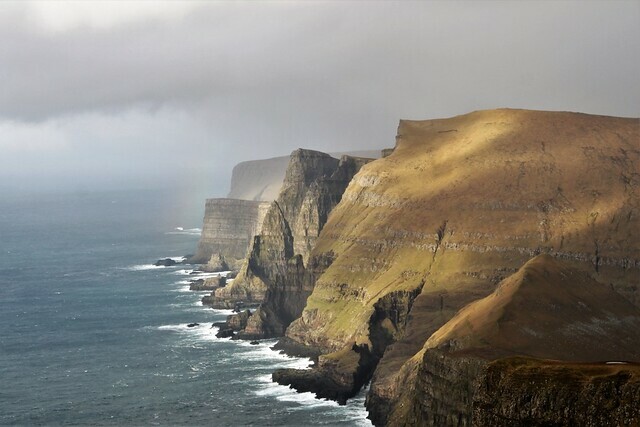 I have been to the Faroe Islands a few times in the past but not for many years. I think I was last here almost ten years ago. It only seemed right to make this my last stop before returning to the UK. My great-grandmother is 96 now so I’d better take my chance to visit her while I have the opportunity. 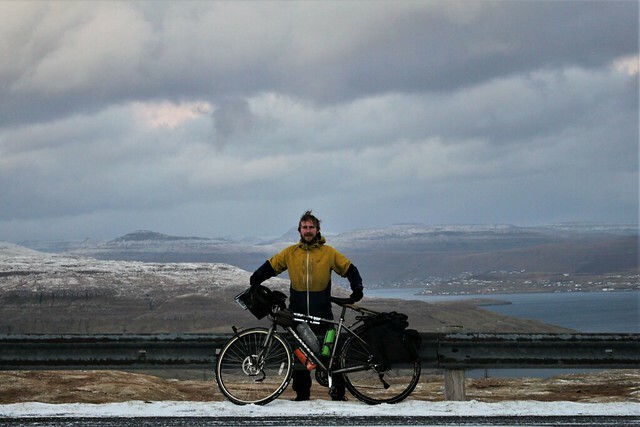 When I cycled off the boat there were a couple of journalists from the local TV (there is only one Faroese channel) waiting for me. If you go to the website linked below and fast forward to 10 min 15 seconds you can see my very brief moment of glory. 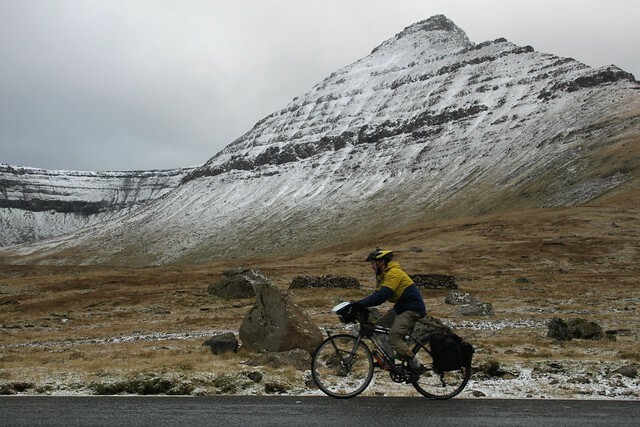 I guess in such a small country someone cycling around the world is worthy of a news story – especially if they are quarter Faroese! 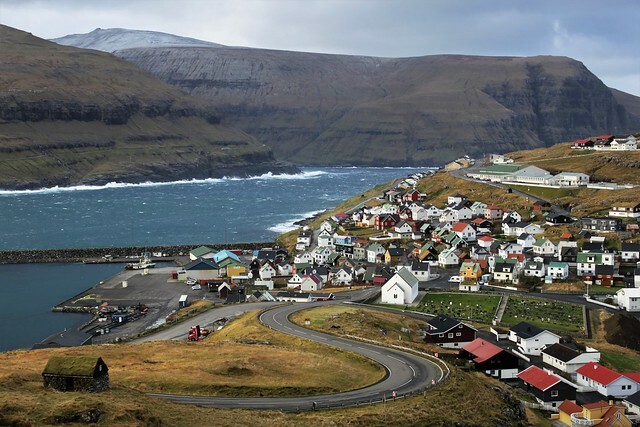 I have plenty of family in the Faroe Islands. They may not be particularly close to me, but they are family none the less and a lovely bunch at that. It was wonderful to see them all again and I felt very welcome and at home even after so many years. 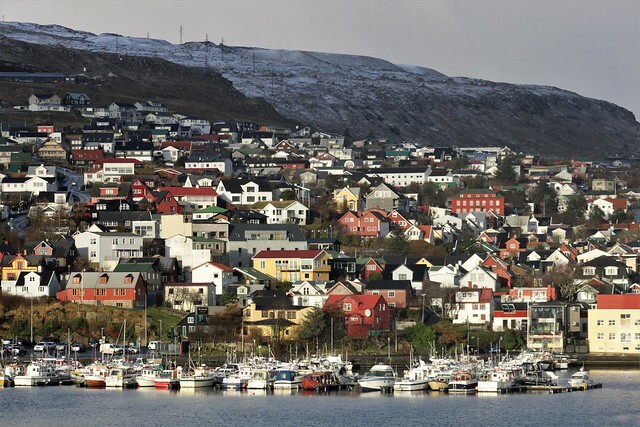 The boat from Iceland arrives in Tórshavn, the country’s capital with a population of just under 20,000. I spent the night with my mum’s second cousin, Guðrun, who came to pick me up from the harbour. My first day was spent out riding. I came here to see family, not to go cycling but I couldn’t resist trying to squeeze in a few miles while I was here with my bike. In the morning I took the bus to Gjogv, a small village in the very north of Eysturoy island. 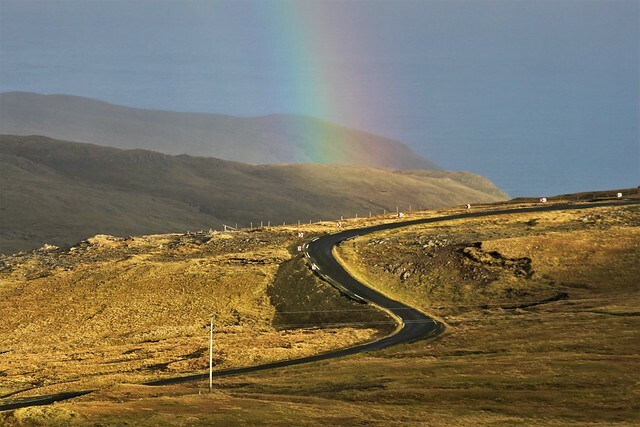 There are lots of little ‘request’ buses in the Faroes where you have to call in advance and ask for the bus to take you. I didn’t know that Gjogv is one of those destinations (in off-season) but there was a Portuguese tourist on board who had already booked it. We transferred in Oyrarbakki and got on a little minibus to take us the last section north. The ‘bus’ driver folded down the seats so I could take the bicycle with us. 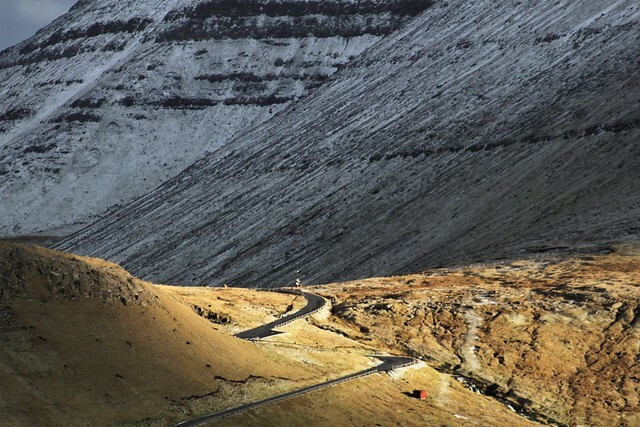 Like many Faroese villages, Gjogv is surrounded by mountains and water so you either need to travel up over a pass or take a boat to get there. I had a tough start to the day riding up the mountain but without all my bags the ascending is easy-peasy. 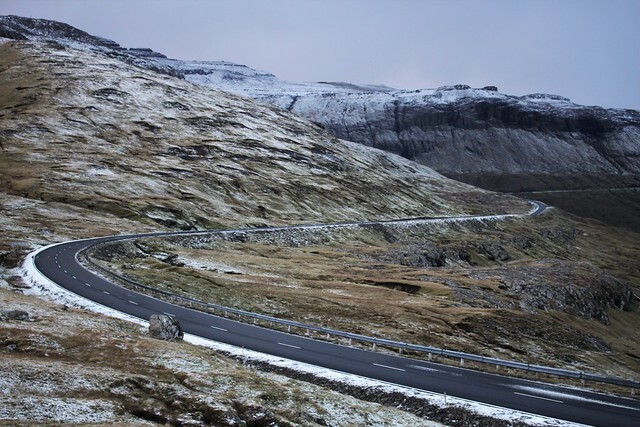 The road heads up to a gap beside Slættaratindur mountain which, at 882 metres above sea level, is the highest peak in the Faroe Islands. 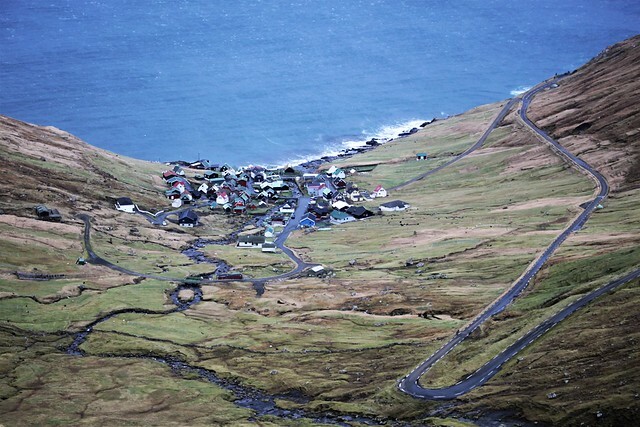 There is a fantastic view from over Funningur village (from where the bus had come up), before you drop down the other side to Eiði. The wind was outrageous at the top of the mountain, just as bad as the worst days in Iceland. It was hard just to stand up, let alone cycle. I had deliberately taken the bus north so that I could make use of the NW gusts and so I flew down the west side of Eysturoy back to Oyrarbakki. 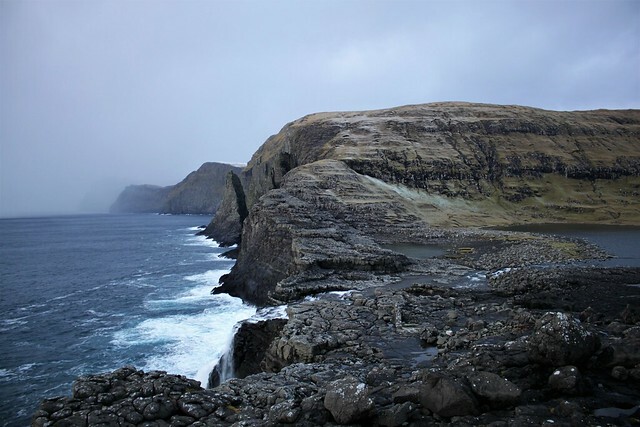 The Faroe Islands are covered in tunnels. 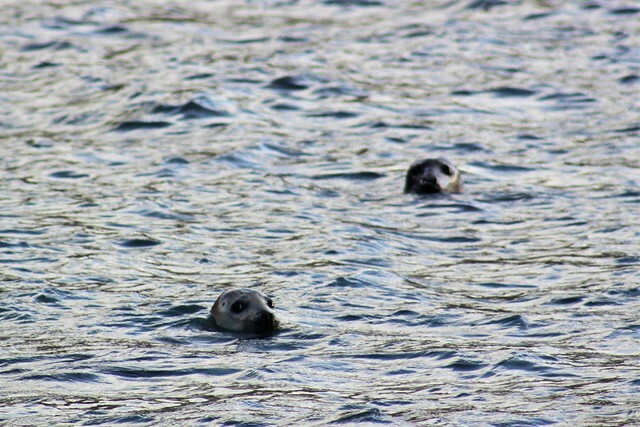 There are about 20 of them, 2 of which are sub-sea. Some are new and fine to cycle through but most of them are old and long (some of them built more than 50 years. You would not want to try riding through those – trust me! As a result it is not really a good place to cycle as you will spend a lot of time pedalling through tunnels. There are, however, ways to get good mileage in without going anywhere dangerous and I’ll list a couple of proposals at the end of this blog. 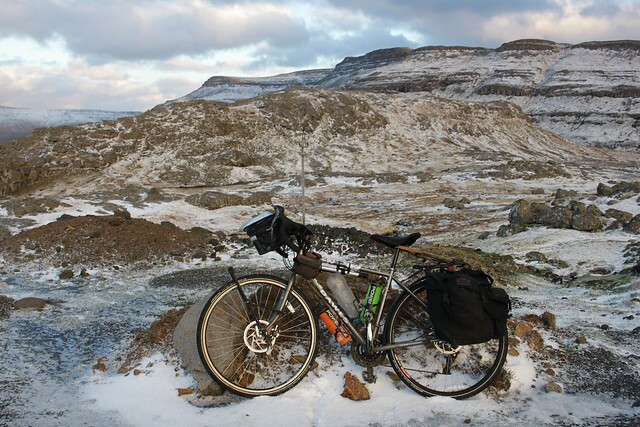 My route from Gjogv to Tórshavn avoided the two tunnels the bus drove through on the way up and was a perfect day of 70km with a little over 1,000m of ascending. 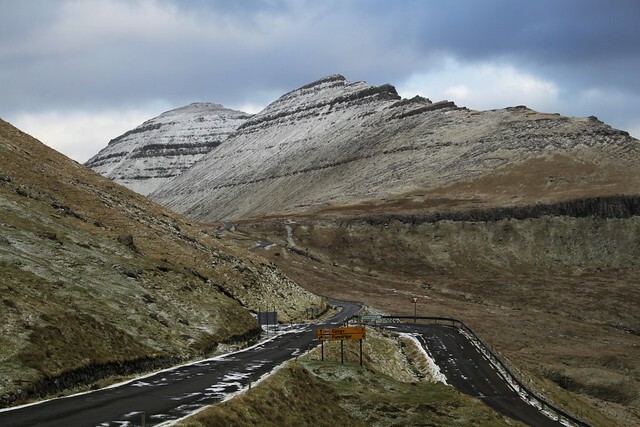 I had to rejoin the main road for 15km after I crossed the bridge connecting the islands of Eysturoy and Streymoy but then I headed for the mountain road to Tórhsvan. The road was extremely icy and there was plenty of snow up there but the views were sublime. I had forgotten just how gorgeous this country is and that route back to the capital was up there with the finest mountain roads I have cycled in the world. 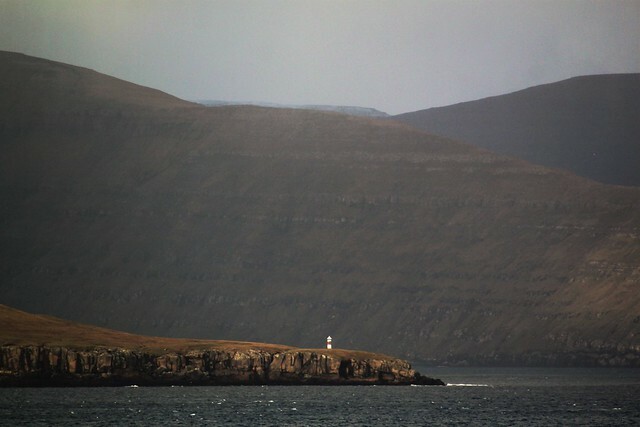 That evening I took the boat down to Suðuroy, which means ‘south island’. 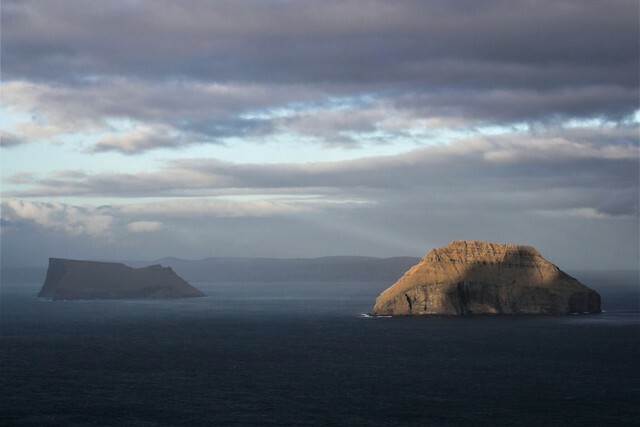 It is the furthest south of all the Faroe Islands and connected to Tórshavn by a two hour ferry. 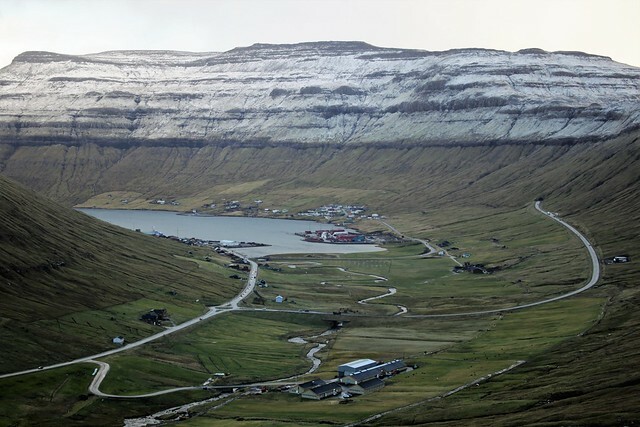 It is on Suðuroy that I have spent most of my previous time in the Faroes because Tvøroyi (the biggest town on the island but still has less than 2,000 inhabitants) is the hometown of my grandmother and where my great-gran still lives. I stayed with Gwøni, my nan’s cousin who lives in Tvøroyi on the other side of the fjord from where the boat docks. 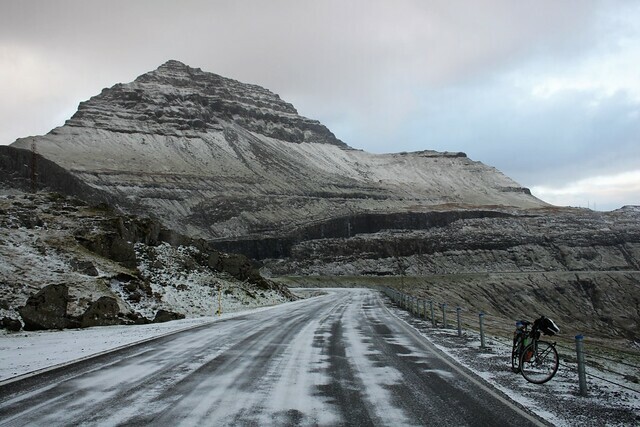 My plan was to go cycling again on Suðoroy because it is the only other 40km+ section of tunnel-free cycling in the country if you take the old roads but when another of my gran’s cousin’s, Páll, offered to drive me around the island I happily accepted. We first drove down to Sumba, which is the southernmost village on Suðuroy and is where my great-great grandad was from. From there we drove and walked a little further to the lighthouse at Akraberg which is pretty much the southern most point of the Faroes. The drive back to Tvoroyi along the old road means you have two mountain sections where tunnels now go. Cycling through the newer of the two tunnels would be fine but the other is old, long and pitch black. 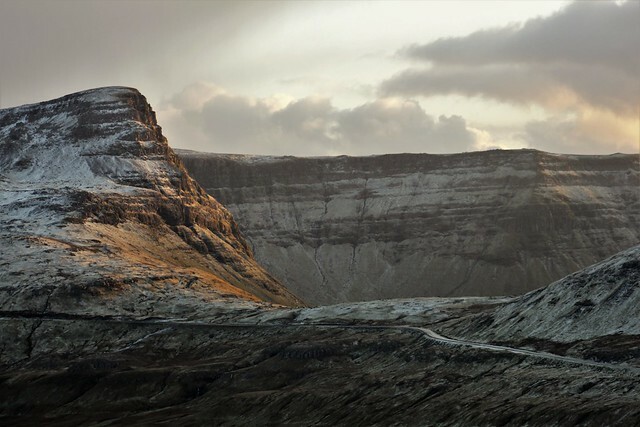 I wouldn’t fancy it on two wheels but I would love to take the mountain road – simply amazing views! It was a shame I couldn’t ride back but now I had the afternoon free which meant I could go for a hike. Páll’s brother Jóan Petur offered to take me for a walk up the mountains behind Tvøroyi. 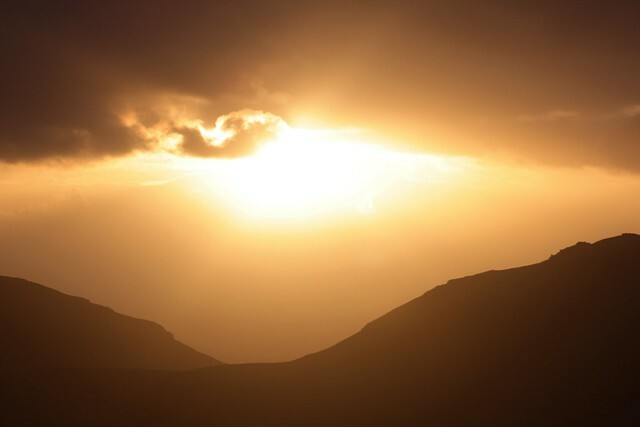 My surname Kambskarð is actually a ridge at the top of the mountains. I have seen it before but never walked to the top of it and I jumped at the opportunity to ascend the summit. It is a rather pathetic ‘peak’ with two large ones right beside but it is the mountain that I am actually named after. First we hiked up to the hill behind Tvøroyi where I have been at least a couple of times before. I remember it quite well. You walk up a neglected track that the British built when they were based here in WWII. 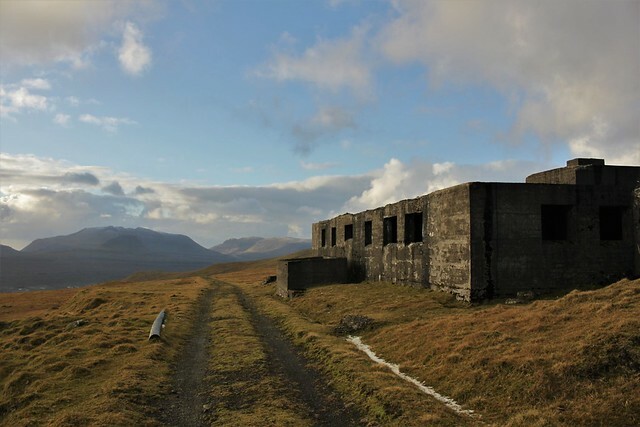 At the top there are some ruined old army buildings and a glorious view north where you can see both Stóra and Litle Dimun. That means big and small diamond. I believe the larger is inhabited by two crazy families but the smaller island only has sheep on it. 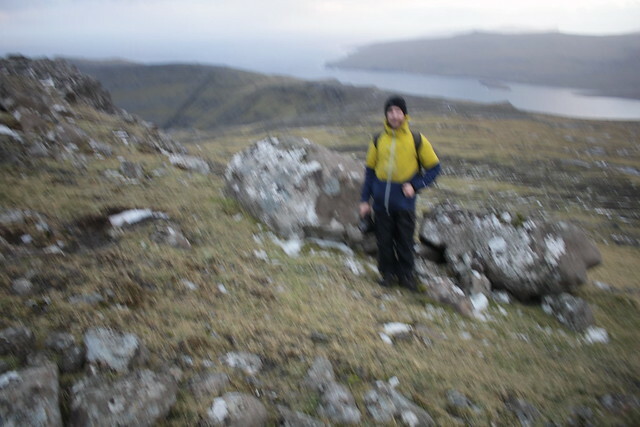 I put the camera on a rock and took a snap with the timer so that I could have a pic of myself on Kambskarð! 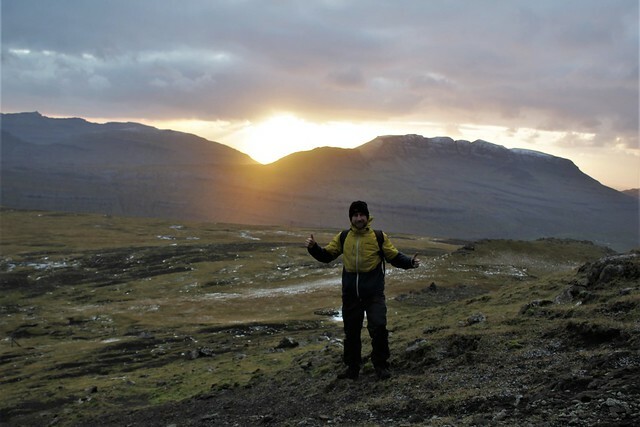 We walked back down as the sun was setting between the gap in the mountains towards and went to Páll’s in Froðba (the village up from Tvøroyi) for a bite to eat. If you thought the sheep head sounded bad, stop reading now. The Faroese have a knack for producing vile food. Nothing scares me more than the smell of skerpikjøt which traumatized my childhood when my nan bought chunks back from the Faroe Islands. 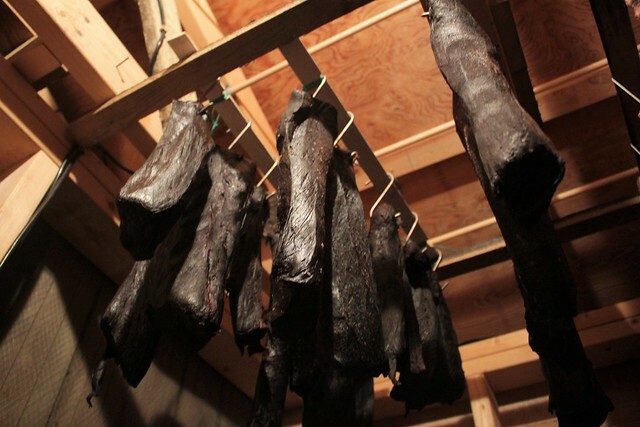 To make skerpikjøt they hang up the sheep for 5-9 months until it starts to ferment. When my grandma has a piece in the fridge her whole flat stinks of it. 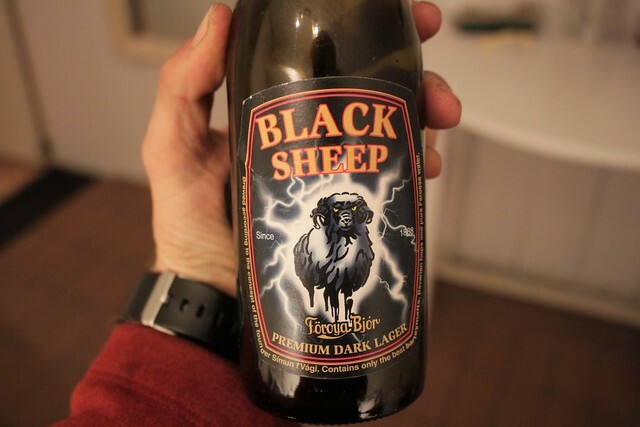 Luckily Páll’s offered up some other type of sheep, which is only slight-fermented and quite palatable. 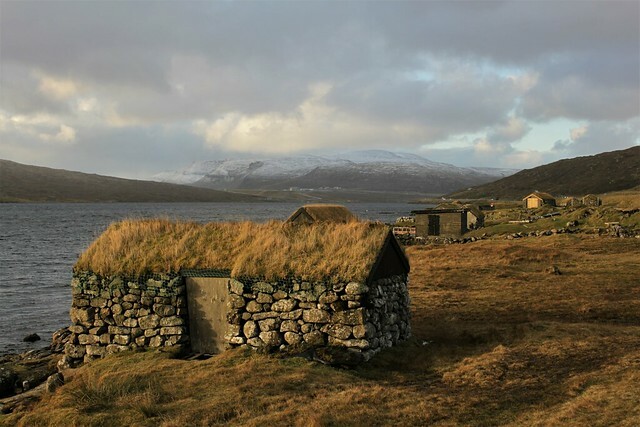 Páll had a special room to hang meat up in right outside his front door, filled up with both sheep and whale. Uh oh – the dreaded W-word! If you have heard anything about the Faroese it is quite likely about their unfortunate taste for whale meat. When they hunt the animals they drive them into the shallow end of the fjord and kill them. After they are dead they cut the neck open which results in an awful lot of blood. The fjords can turn bright red, which results in some rather dramatic scenes. These images, accompanied by anti-whaling messages unsurprisingly strike a chord with many people. The problem with the anti-whaling propaganda is that an awful lot of it is incorrect. I’ve read chain-emails that say stuff about whale killing being a right off passage for Faroese boys, about the please they take in killing the whales as brutally as possible about how it is done for sport – all of which is nonsense. 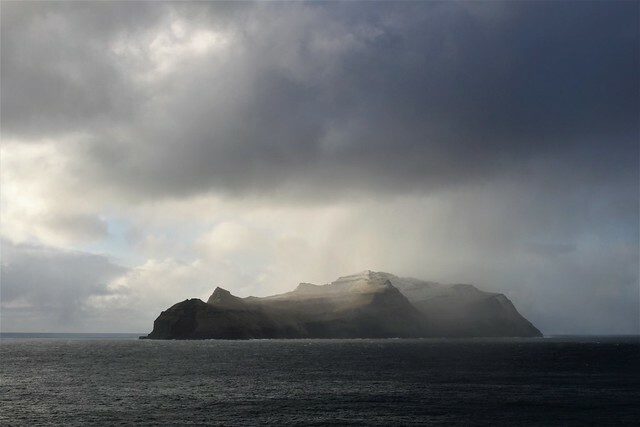 The Faroese don’t actively sail around the islands searching for whales to kill but if a pod is spotted inside a fjord then they sound the alarm, everyone stops work, jumps in a boat and heads out for the hunt. The whale killing is monitored and regulated, they are slaughtered as killed as quickly and efficiently as possible and the meat is shared out between the whole community. I suspect the last half hour of the whales’ life is pretty unpleasant but the rest of their lives they are completely free in the great oceans. Páll had the meat because there had been a hunt in the fjord across the mountain but they don’t do it often. 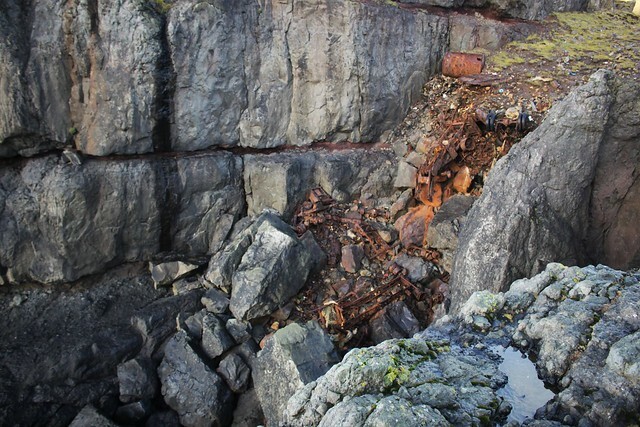 I don’t think there has been a hunt in Tvøroyi’s fjord for many, many years. Whether or not the whales are endangered of plentiful depends on whether you listen to the Faroese stats or the protesters. You can do the research and make up your own mind. Personally, I will focus my attention to the meat industry where animals are bred to slaughter. The treatment of cattle on the feedlots such as the one I worked on in Australia, the battery chicken farms and the awful strain that our mass breeding and management of livestock puts on the environment. Those are more of a concern to me that than the Faroese and their whales. 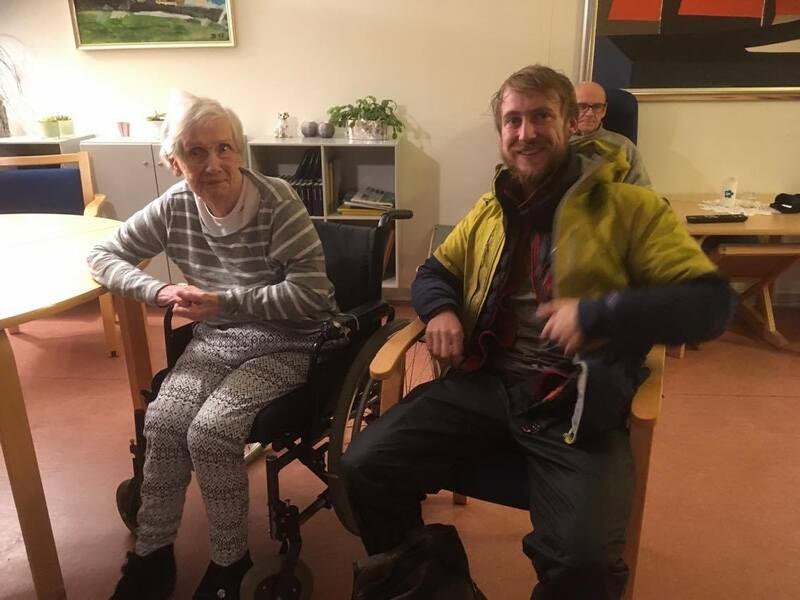 After dinner we went to visit my great-grandmother, Judith Kambskarð who has been in living in the retirement home for the last couple of years. Sadly, her house was sold last year so I wasn’t able to visit the place we used to stay when coming to Suduroy. I call my grandma Omma which is Faroese for gran. I call my grandad morfar (which specifically means mum’s dad), his Danish title. I must have been confused having to address grandparents in 3 different languages so I just called my great-gran Omma Omma. It should be Langomma (which means long-grandma) but that was far too complicated for me and Omma Omma stuck. She is superstitious about travel and hasn’t left her island for decades. I used to hate talking to her on the phone when I was little. Not because I didn’t want to speak to her, but because I found it so hard to understand her on the phone. She spoke Danish to me in such a thick Faroese accent and I’m sure most of the words she used were just Faroese. Danish was my second language too and as a result I often had no idea what she was saying to me. It was difficult on the phone when I was little, not an issue in person. 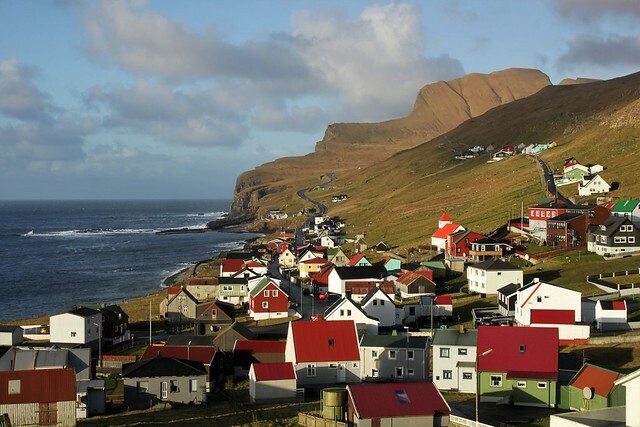 It’s funny – some of the Faroese have a very slight accent when they speak Danish, others so strong I have to really concentrate to understand them. She doesn’t remember too much anymore but at 96 I think she has a good excuse. To my surprise she did remember me – but it probably helped that they’d told her at least a couple of times that I would be coming to visit! It was so lovely to see her. I’m not sure how many more chances I will get and so I am very thankful for this one. 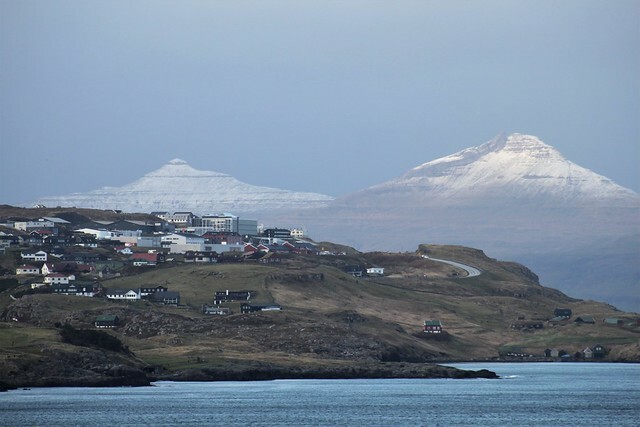 I took the boat back to Tórshavn in the morning. I was sick of the boats. I’d now spent 24 hours sailing in 4 days. I felt dizzy a lot of the time because my sea legs couldn’t handle the transition. I was just happy to have made it without puking. 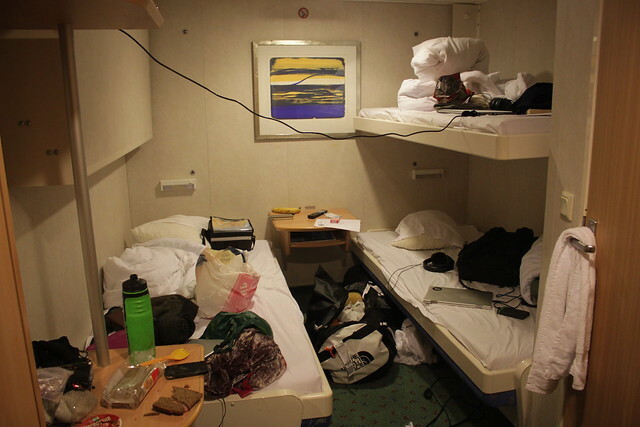 That ferry can be awful – I’ve never made the return journey without vomiting at least one of the ways. If you want to see how bad it can, check out this video. The Iceland-Faroe Islands-Denmark one can pretty hairy too, judging by this clip. Guðrun took me for a drive around Vágar island in the afternoon. We visited Gasadalur – one of the islands’ most photographed spots but somewhere I’ve never been before. Like many of the spots in the country – I’m sure you’ll agree – it was quite magic. Tourism has exploded in the Faroes since I was last here. They are getting the tail-end of the Icelandic tourism boom and I’m not sure how they all feel about it. 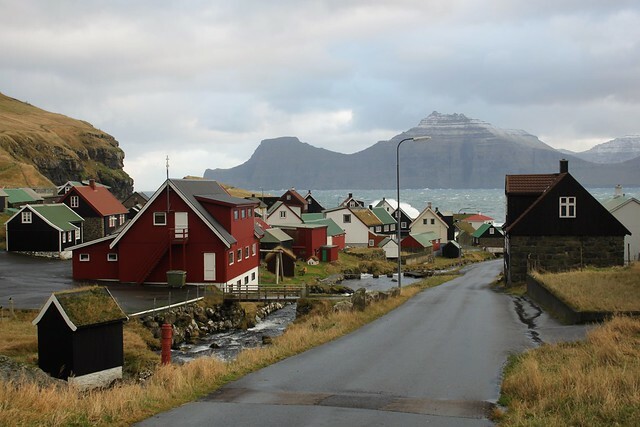 If you live in the more famous little villages like Saksun you will live in a community of maybe 50, but thousands of tourists will visit every summer. It must be annoying if you live somewhere like that. Farmers have complained of tourists chasing pregnant sheep around and residents have been harassed by visitors flying drones over their little houses. Many of the Faroses are watching what has been happening in Iceland very closely, I think. 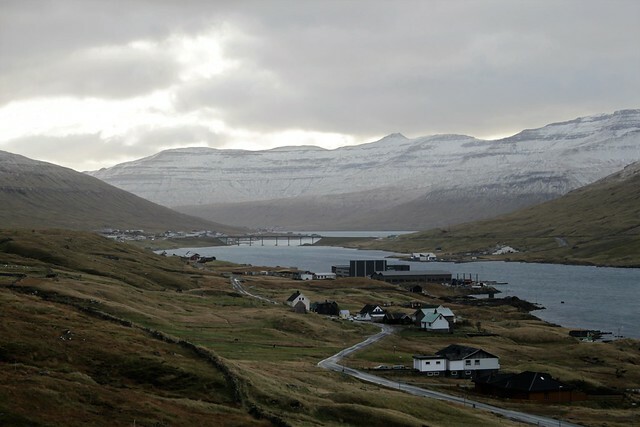 Gwøni said that she did not want loads more tourists coming to the Faroe Island, despite the money it would bring. She said that Iceland had been spoiled by the numbers and the Faroe Islands are too small to deal with so many visitors. 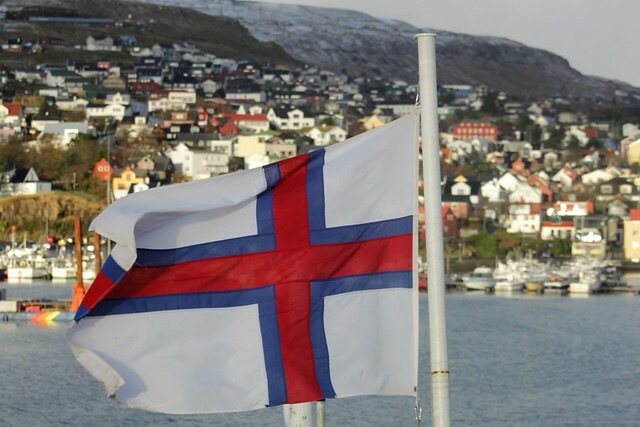 I suppose the key difference is that the Faroe Islands don’t desperately need the money, unlike Iceland – who definitely did after the economic crisis. I have spoken to other Faroese who would like to see tourism become as profitable as the fish industry but I guess they aren’t the ones who life in Saksun. We shall see. 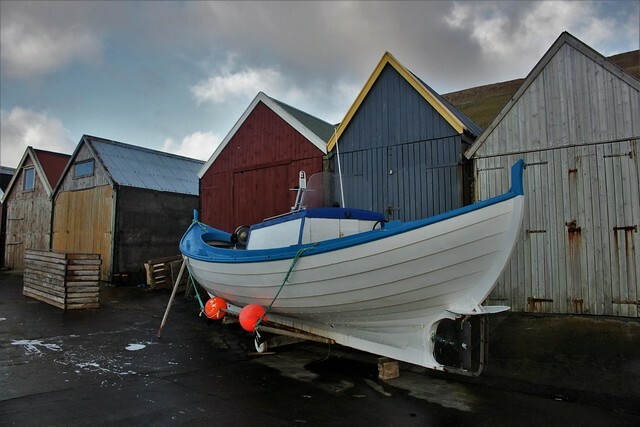 For now, you can head to Suðuroy where very few of the tourists make it down to (especially those just stopping for 3 days on the boat to Iceland from Denmark). They are talking about building a 26km long sub-sea tunnel to Suðuroy which would suddenly make the island incredibly accessible. 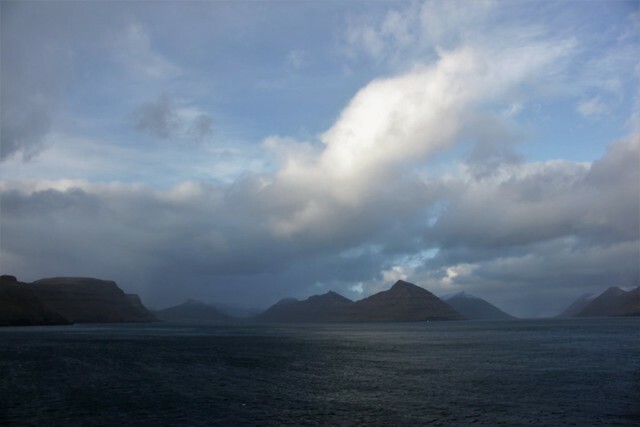 You may also know the Faroe Islands from the viral video Sheep View. Some locals were upset that Google hadn’t taken their Street View to the islands so attached some Go Pros to sheep instead. Google may still lack a translate feature for the Faroese language but they did finally release Street View for the islands just a few days before I arrived. It is not a totally forgotten about corner of the world anymore! 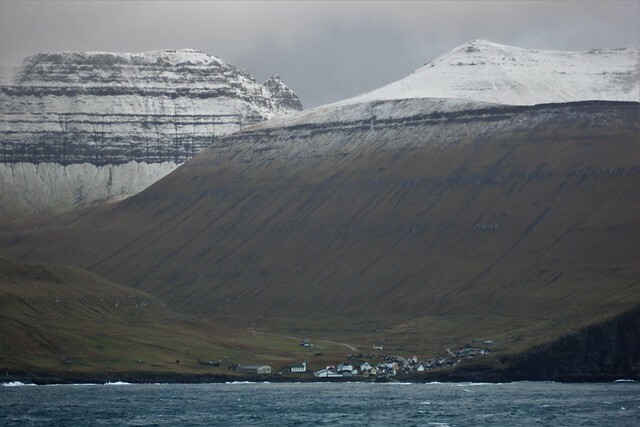 I am very glad I got to pop by the Faroe Islands on my way back to the UK. I am grateful to have such lovely family to visit, grateful to have got so lucky with the weather and most of all – incredibly grateful to have been able to visit my Omma Omma. 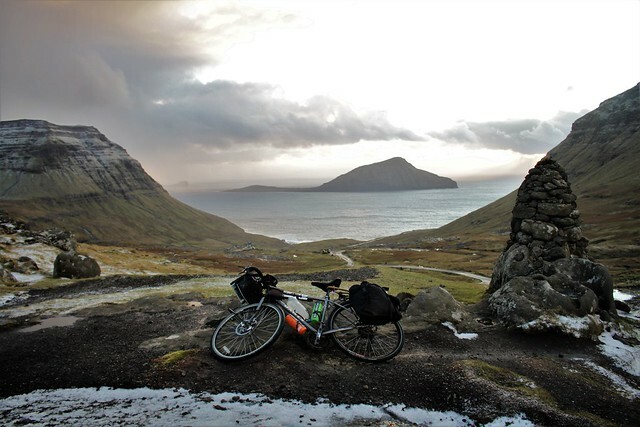 PS: I said above that I would include a little info on cycling the Faroe Islands. There is not much information about this online so let me propose a couple of routes that are safe. It is quite easy to take bike on most of the main bus routes. If you rake the bus to Nes from Torshavn you can ride 100km back to Torshavn without going through a tunnel. Take the road to Funningar and over to Eidi. 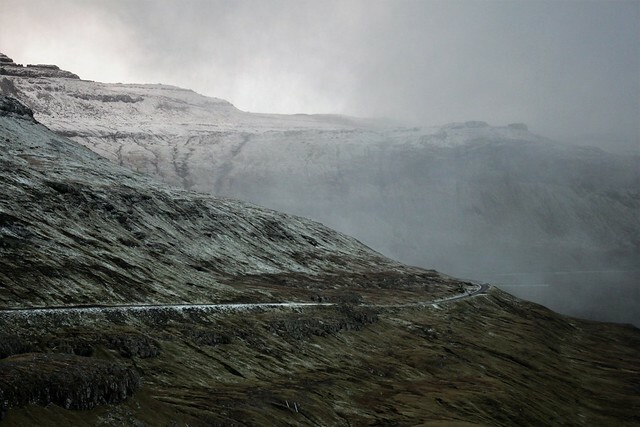 When you cross the bridge at Oyrarbakki you can follow the old mountain road back to Torshavn (as I did). If you stopped somewhere on way this would be a leisurely two day ride. You could also take the boat down to Suduroy and then a bus to Sumba and the very bottom of the island. From there it is a 40km ride back to Tvoroyi if you follow the old roads and avoid the tunnels. Not too far but plenty of mountain climbing! 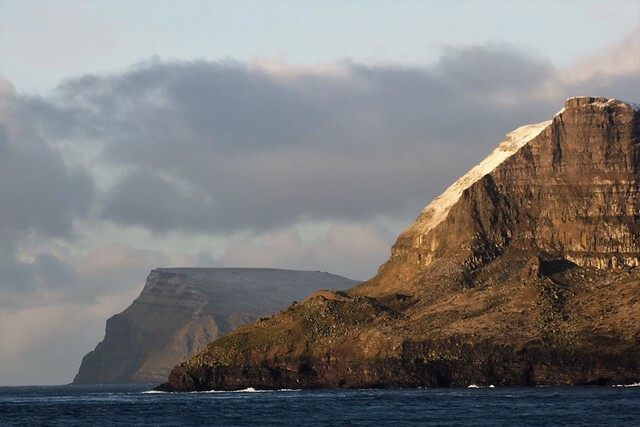 If you are travelling to Iceland by ferry from Denmark you can have a 3 day stop over in the Faroes. The above proposal could probably be done in that window and would be a fantastic way to see some of the islands. Happy pedalling!